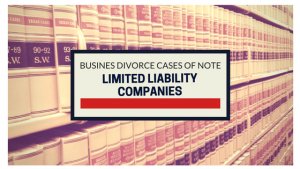 Petitioning members and managers of limited liability companies need to choose carefully between dissolution and dissociation of a member when they initiate litigation to expel a “bothersome” member. If the petitioning member includes grounds for both, they will not be able to choose the preferred remedy. Rather, the trial judge has discretion to choose between the two remedies without consideration of the preferences of any of the parties. The District Court of Appeals has held that the D.C. Code “substantially mirror[s]” language in the Revised Uniform Limited Liability Company Act (RULLCA), which grants discretion to trial judges to decide between dissolution and dissociation when grounds for both causes of action are present. The D.C. court’s decision in Reese v. Newman, 131 A.3d 880 (D.C., 2016) disagreed with the appellant’s interpretation that the statue’s language compelled trial judges to disassociate a member of an LLC when one of the enumerated grounds for expulsion has been established. C. Allison Defoe Reese, the appellant, argued that the language “a person shall be disassociated” was a command to the trial judge to disassociate the appropriate member and removed the judge’s discretion to choose between the remedies. The court found that the language in question was not directed at the judge at all. Instead, the language mandates the expulsion of the member when the court has already determined in its discretion that a member “shall” be dissociated. The placement of the “shall” before a list of enumerated conditions only provided fifteen separate circumstances for which a member of an LLC can be dissociated. Furthermore, the court emphasized that the District adopted language that “substantially mirror[s]” the language in RULLCA and noted that the official comments to the relevant provision in RULLCA provides support for the trial judge’s discretion in choosing between dissociation and dissolution when there are grounds for both.